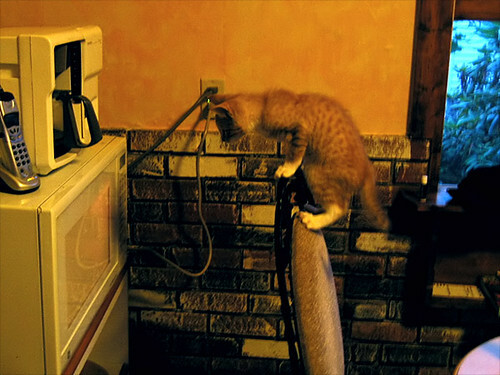 I decided it was time to do some refrigerator- and pantry-cleaning tonight, and the results came out surprisingly well. I’m not sure what one would call this — it’s not palak paneer, because of the potatoes, but it’s not aloo palak, because of the cheese. In any case, it’s easy, and it’s good. Melt the butter over medium heat until it begins to bubble. (Land O’ Lakes really is the best, with the least milk solids of any brand I’ve used.) Mix all the spices together, thoroughly, with your fingers. Add half — only half — of the spices to the melted butter and brown them for about five to seven minutes. Add the onion and sauté for 4-5 minutes, until it starts to become translucent. Add the garlic and sauté for another 2 minutes. Pour in the vegetable broth and water, deglazing the pan, and add the other half of the spices. Add the potatoes and bring to a boil, and then reduce to a simmer. Cover and simmer for 20-25 minutes, until potatoes are almost (but not quite) done. Half-mash the potatoes with a wooden spoon or potato masher — leave some big chunks, because they’re going to cook a bit longer. Increase heat to medium and add cottage cheese and spinach. Stir and cook uncovered for another 6-8 minutes, until the texture is thick and the spinach is wilted. Serve hot. And somebody tell me what I should call it. I’m not usually one to do the quiz thing, but I saw this at k8’s, and was curious if I’d changed much in the ten years or so since I first encountered the MBTI. Nope. Still strong INTJ. A little less extreme on the thinking/feeling axes than I was ten years ago, but otherwise mostly the same. I’m familiar with the criticisms of the MBTI — the concerns with vagueness, and the concerns with telling people things they want to hear about themselves — and I get those concerns, but I also think that people aren’t necessarily coming to the MBTI with high expectations of scientific validity. I mean, I don’t really buy astrology — it seems fundamentally ridiculous to me that your personality traits can be in any way determined by the moment at which you’re born — but at the same time, I’m like “Yeah, I am so totally a Scorpio, and so not a Leo or a Pisces.” The supposed attributes of a Scorpio, in their differences from the attributes of other signs, help people tell stories about themselves in relation to others, much as the Myers-Briggs types do. There’s an excellent article in the June 2007 CCC that’s had WPA-L abuzz with excited discussions, objections, and elaborations. I think the excitement over the piece — “Teaching About Writing, Righting Misconceptions: (Re)Envisioning ‘First-Year Composition’ as ‘Introduction to Writing Studies'” by Douglas Downs and Elizabeth Wardle — is merited: there are some startling ideas here, provocatively posed, and Downs and Wardle have certainly got me thinking. Composition, they suggest, isn’t only (and shouldn’t be) about teaching a set of discrete and isolable techniques that help students write good essays in standard academic discourse for their other classes; and they thoroughly demonstrate how the study and teaching of writing has been shown in our discipline’s research to be considerably more complicated than that. (My inadequate account of the article does it discursive harm: please, read it yourself, rather than relying on my poor summing-up.) As some on WPA-L have pointed out, the article is not without its difficulties, and there are perhaps some underexamined terms and arguments, but overall, it’s a smart and exciting piece that’s sure to continue to stir discussion. One passage in particular got me going, because of my institutional situation here at the Point, but I imagine others might have found it provocative as well. My situation: I’m civilian faculty, an assistant professor, with a PhD. As in most departments here, our faculty split is around 70/30 or 80/20 military/civilian. Military junior faculty come in with an MA, teach three years, and rotate back out into the Army, possibly coming back when they’ve got their PhDs, while civilian faculty tend to be more permanent. This proportionally faster turnover rate for military as opposed to civilian instructors creates some unique instructor training exigencies, as does the fact that the Army pays full ride for its military instructors’ graduate degrees, and strongly discourages (perhaps even forbids?) them from working as teaching assistants. So our Army instructors come to us with no college classroom teaching experience, although of course they’ve held company command and have immense experience leading and managing hundreds and sometimes thousands of soldiers. The military junior faculty are, on the other hand, burgeoning experts in their chosen fields, which tend for the most part to be associated with literature. the myth that content is separable from writing — that a FYC [first-year composition] instructor need not be expert in the subject matter of a paper in order to evaluate the quality of writing in that paper, or need not be a subject expert on writing in order to teach writing. Such claims accept the premise that writing instruction can be limited to fluent English syntax, grammar, and mechanics. The first statement raises some difficult and complex concerns for me, but I very much agree with the latter sentiment. I can’t help but bristle when I get well-meant emails from friends or family equating what I do with teaching basic rules of grammar and mechanics. I am an expert on writing, just as my friends who teach chemistry or literature are experts on their topics, and I teach writing well. And this summer, I’m taking part in our arriving faculty workshop, and helping to talk to junior officers about best pedagogical practices for teaching first-year composition. Some of them — who’ll be teaching sections of first-year composition — have barely heard of our discipline. Certainly, some are enthusiastic: one major, although she wasn’t presenting, registered for this year’s CCCC in New York and took the train down two mornings to attend as many sessions as she could, and came back (to teach her afternoon classes) deeply enthusiastic and quickly put together a proposal for 2008. And certainly, we’re training them, to the limits of our time: we’ve got sessions on the rhetorical situation, the writing process, peer response, conferencing, commenting, reflection; we’ve got a set of required comp-theory readings; they’re watching Take 20 — but does that constitute being “trained in writing studies”? I don’t know. It’s a start, maybe. But it’s a question Downs and Wardle raise: how does the pedagogy they propose intersect with academic labor practices? Even if the pedagogy they propose is a good thing, which I most definitely think it is, how can it be done? What do we do at my institution, if we have only a tiny fraction of our composition instructors with expertise in writing studies — and what does it mean to have expertise? One draft of a co-authored piece, sent off Friday morning: done. One piece of substantial and enjoyable assistant-editorial work, sent off Friday evening: done. One draft lesson plan of a session for our arriving faculty workshop: done. One enormously pleasant afternoon — today — showing an old, good friend around campus, said friend enthusiastic and intrigued by all the military training going on with M16s and camouflage and the balance between that training and the academic project: done. Still to do before summer’s end: a quick-turnaround response piece that’s going to occupy a lot of my time for the next few weeks. Still to try to do before summer’s end: condense my dissertation’s overarching argument about political economy and teaching writing in the information age into a digestible piece and send it out. Still to do before year’s end: turn my conference presentation on Tacitus and weblog rhetoric into something to send out. Still to do right away: stay in better touch with old, good friends. After lots of investigating, emails, and phone calls, I finally found a no-kill shelter with slots for the two kittens, and as of tonight, they’re hanging out with other cats and in no immediate danger of being euthanized, tormented, run over, or eaten. It took some doing, and I’m relieved: I couldn’t rightly conscience letting two young beings I’d had in my care chance easy harm or death. Tink and Zeugma don’t miss them — well, maybe Tink, a little — but I do. OMG!! It has soundz AND movez AND foodz! WANT!!!1!!1! And I’ll be volunteering for a few hours a week at that no-kill shelter, starting tomorrow morning. I’m tired, dirty, stinky, and my hands look like hamburger. But with immense amounts of wonderful and generous help and guidance from my dad and brother, and a whole lot of work this morning and a long, long day yesterday, my house looks eighteen billion times nicer. Here’s the link to the flickr photoset, which I duplicate below with some narrative. 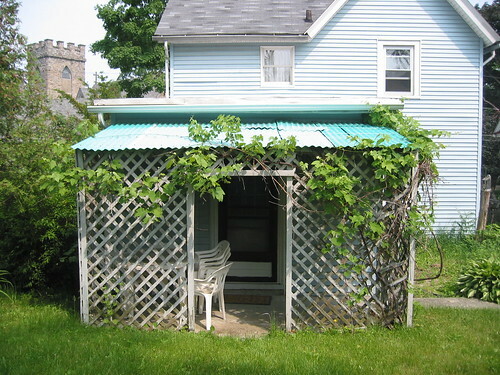 The ugly old shed with pretty grape vine on the back of my house.